That would be an honour, but I think I'd be too nervous. I can't battle Angelboy because I just tend to freeze and stand there like a rabbit in the headlights!! Somehow, I have no issue with fighting Ralenzo, even though he beats me of course and I know Angelboy is watching. I guess it's because he's not using Yoshimitsu. Anyway, I tried relaxing my grip. It was harder than I thought because I've developed a habit now. So I wouldn't say my hands were completely relaxed, but some things were coming out more easily and also a lot faster. Some moves that never work for me, were finally appearing. Yoshimitsu DOES like to tease me, it would seem!! Oh and I was also surprised at how much I still remember after a 4 week break. @ yoshidivine, It is obvious that you DONT play with law, I play with LOTSA different characters and I know for a fact that yoshimitsu is not the ONLY character you need to train with. You're not the only one, there are more people like you who think other characters have it easy. 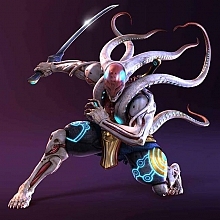 IT IS NOT, it is true that yoshimitsu is a weak character and that you need to improve yourself and your gameplay a lot to win with him, BUT other characters also take dedication, training and hard work. The difference is, hard work pays more off with those characters then yoshimitsu. I DID read it and I'll try to keep it in mind. It's more or less what I do anyway though. Well, I sometimes forget to block and get too aggressive, -still need to work on that ^^ I mainly do stick to basic moves. I mean, just because I can do a few nice combos in practice, most of them, I would never use in an actual fight. They are sure to fail because there are so many other factors to consider (like the fact my opponent moves and fights back ^^) and I am very inconsistant. Some nights they come out fine, other nights I can't seem to do them at all!! I sometimes play around with them in arcade, to see how they stand against a moving target, but you'd never see me use them in a fight until I can do them without thinking and have a better idea of when to use them. Anything else is just setting myself up to fail. It's not that I don't use any combos at all, Angelboy taught me a few simple ones which are just about fool-proof enough even for me!! Anyway, thanks for the encouragement everyone. It really does keep me trying! @Jembru, I can totally see where you're coming from with the inconsistency. i face that same problem too, sometimes its minute and sometimes its major. then i found out why it happens every now n then to me, i realised its because i forget what my previous strategy was, or that am overwhelmed by victory. another strange fact about my style is that if i'm facing a kyu or a dan, i tend to loose, simply because my brain/body refuses to put out its entire best against people of those levels.... pitty. i feel so evil powdering the weak ones. question to jembru, have you had any previous fighting experiences? i.e. have you played any other fighting games in the previous years? Hey Yoshidivine. No, I have not played another beat 'em up. The closest to a 'fighting' game I have played was Pokémon. I played Lemmings, Sonic and Tetris up until the age of about 11 and from then, I started to only watch others play games and never played myself, besides Pokémon. Watching always gave me more pleasure than playing, odd, I know, but this is how it is. I am inexperienced in most aspects of gaming, so I understand that there is a lot of work ahead of me. Things that seem like a no-brainer to others, need to be explained to me sometimes. Wait.. although I never took it seriously, I DID play SC4 for a few months when it first came out. I stopped playing when I realised I couldn't switch between tekken and soul calibur input so had to choose one or the other to master. There seemed to be a lot more action in the Tekken world, so I chose to go where the adventure was!! I played SC3 a few times too, but I mainly just kept making Yoshi say 'onion' over and over and giggled a lot. I don't know how you would feel about this but I would recommend you to try out the new mortal kombat, I could imagine it would be very good to learn basics from and its surpriceingly fun to play, the moves aren't difficult to learn and there aren't a million moves like in tekken and it got a simple tutorial you will be starting with learning to walk forwards so thats taken care of. street fighter 4 was a disappiontment compared to street fighter ex 3.... that game was a beautiful art. SkulloMania!!!!! but AK's right try out MK, i thought i suggested something similar but was totally ignored by the population. whatever. but i still believe that its important to have a fighting background in order to grasp certain key concepts. Killer Instinct is THE game for you to experience ANYTHING & EVERYTHING! its simple its eazy and its a damn good game. then comes Rival Schools where you could put all that you've learned into play. and i played tetris attack, and i still do now... start from scratch, and work your way up. and watch lots and lots of anime, it helps! especially shippuden and School Rumble! watchin these will teach you how to relax and believe in yourself!!! oh, and one more thing, i realized that Yoshi mumbles the word "MASHPOTATO" when he's K.O.ed LOL LOL i always found it funny, but because i'm familiar with the Japanese language, am sure he actually said something along the lines of "MASAKA" <--which means impossible or NO WAY! Yoshi used a similar term... it sounded like he said "MASATE TO"<--- It Cannot Be!!! or something like that... correct me if I'm wrong. You serious, you think SF4 is a disappointment compared to SF ex. The only thing good about sf ex was the art and characters. Sf4 brought the community back together, it has never been this big since the street fighter 2 days. But you gotta be honest with yourself, SF4 is far more superior compared to the ex series. And even though all those ex characters are owned by akira I secretly still wish that skullo and others will appear in an upcoming sf or capcom game. @YoshiDivine: Yoshi says "Honmatsu tenntou", which means: "I miscalculated!"